NOW BOOKING HUNTS FOR 2018! Call Today, as these hunts will go quickly! Hunters are selected on a first-come, first-served basis with guest house accommodations and guides provided as part of the package. Due to our commitment to progressive wildlife management techniques and beliefs, hunts are extremely limited and harvesting of game strictly controlled. We hunt from four-wheel-drive vehicles and spend much of our time glassing. Populations of wild game exist in this natural habitat and are available for hunting packages such as javelina, quail, dove, turkey, wild hog and varmints (coyote, bobcat, and fox). 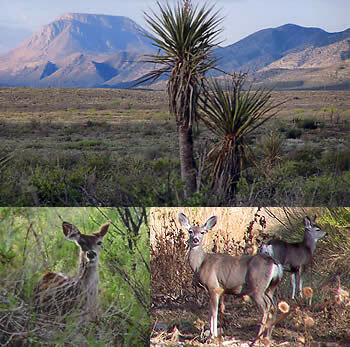 Quality meat processing and taxidermy services are obtainable in Alpine, Texas. We understand the importance of just getting out of doors is worth the trip, but achieving success in your hunting quest is what we deliver. © 2006 Cedar Mountain Ranch, Inc.